Back Track Disco have been in the business for over 28 years, we pride ourselves on our professionalism, reliability and ability to guarantee customer satisfaction. We provide a first class service, its our job to ensure you and your guest have a great experience! We have three packages, tailored to cater for all tastes and budgets. Designed to be ideal for any occasion – Birthday Parties, Weddings, Anniversaries, Corporate Events and many more. 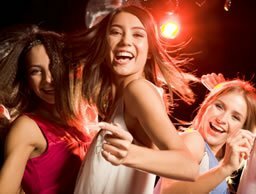 For convenience, you can book any of our disco packages online, paying only a deposit to secure your booking. Back Track Disco are proud to be able to offer the ultimate extra for your disco. A stunning, twinkling, high quality dance floor which looks amazing. It’s a new and sophisticated twist on a traditional dance floor. Add it to your disco package when you book. Check our availability and book your disco event, live online by selecting your date, start time, package requirements and any additional extras. Once selected, enter your venue details and make a 50% deposit payment of the total cost, to secure your booking. Experienced DJ & Mobile Disco Hire in Surrey & Surrounding Areas. Established over 28 years ago Back Track Disco pride ourselves on the highest levels of customer service and satisfaction. At Back Track Disco we are passionate about what we do and getting it right first time, every time. We have a range of disco hire packages to suit almost all party and event types. We cater for all tastes and budgets and venues. Back Track Disco never use agencies or hire equipment as part of our regular performances. You can rest assured that we carry full public liability insurance and our sound and lighting equipment is of the highest specification and PAT tested. As part of our continued development and evolution you are now able to book your disco hire, party or event directly with us online. You can simply check our live availably calendar, choose your date and select any optional extras. You are only required to make a 50% deposit payment to secure your booking and your will receive instant confirmation via email. I write to confirm that Back Track Disco have been the DJ’s for many of mine, and my late husband (Maurice Gibb), New Years Eve, and Birthday parties over a number of years, where we reside in Esher, Surrey. Thank you Paul for such a brilliant night. I can’t thank you enough for putting our minds to rest. Chris and I would like to thank you for organising our disco on our wedding day. We had such a good time and all of our guests really enjoyed the music. We have got some great pictures of the evening and great memories of a very eventful day. Paul, a massive thank you from us both on your DJ’ing skills on the 1st July. It was fantastic and everyone had a ball. It was great to see people up and enjoying all the genres of music. We just wanted to drop you a line to say thanks for you and your brother’s great support with the entertainment at our dear friends Gills 50th Birthday Party recently. Your professionalism and “can do” attitude enabled our sound crew to work seamlessly with you so that the transitions from disco to our live performances and back to disco during the evening appeared completely effortless. Your choice of disco music was cracking as was evident from the constantly packed dance floor – and we, Nicky and Lee were also dancing back stage whist preparing for our show, so thanks for the warm up! Back Track Disco has provided music for several Moody Blues Official Fan Club parties. The DJs, Paul and his brother Mark, always behave in an extremely professional manner, have a very broad music knowledge and instinctively know what their clients require. I would just like to say that you did a fantastic job of DJ’ing at our wedding, everyone thoroughly enjoyed themselves and loads of people have commented on how great the music was on the night. Our only disappointment was that we couldn’t carry on partying into the early hours it was that good! I would just like to say thank you very much for your contribution to our annual staff party. Everyone commented on how professional the disco was and your excellent selection of music really got the party going. It has been a pleasure working with you over Christmas and I very much look forward to continuing our working partnership. Once again we thank you for your input to our Christmas party. There is no doubt about it, the combination of The Searchers music and the terrific choice of sound by Paul of Back Track Disco made the night a huge success. It was a special wedding occasion after all, much of the credit has to go to Paul. See you on another stage soon. your choice of disco music was cracking as was evident from the constantly packed dance floor – and we, Nicky and Lee were also dancing back stage whist preparing for our show, so thanks for the warm-up! I was so impressed with the presentation and performance that when I was planning my 60th birthday in November I contacted you very early so that I made sure to book you for my party. As it turned out it was a good job I got in early as you also had another booking for the same night. Your brother Mark covered my party for me and he also gave a faultless performance.